We traveled up the Bowman trail continuing up Yellow Jacket to the ridge. 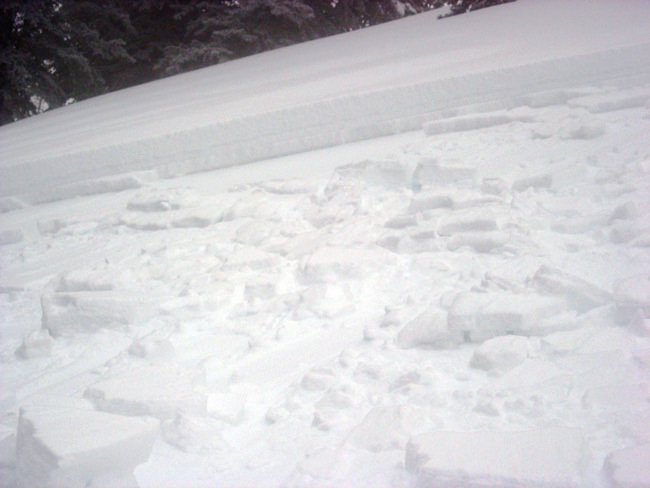 Kicking cornices into Alexander produced slides in the new snow, not unexpected with the winds. 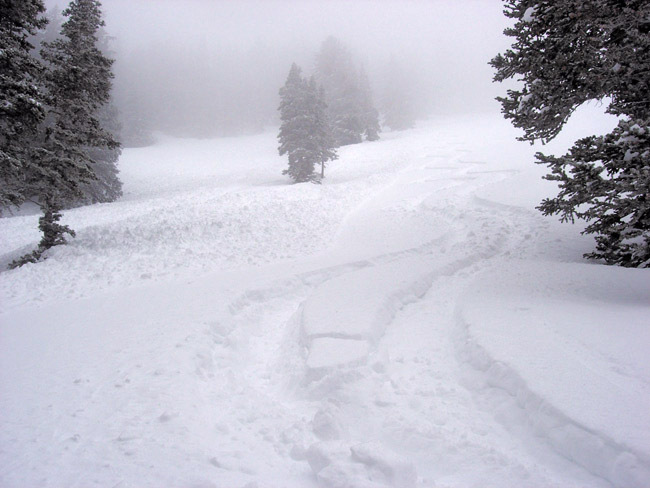 Skied down Yellow jacket and followed the track back to the ridge, skiing into Alexander. This is a close up of a crown in Wilson Glade. Getting to that. We ascended up into the Wilson Glade area, where some discussion dictated heading to the west and making a track up the east facing, with a firm crust. We had experienced some localized collapsing in the wind sheltered and shady, feeling better about having a firm crust under the new snow. This slide was triggered from about 100 yards away over on the north facing, very sheltered Wilson Glade. The slide broke well down off the ridge in an area, unaffected by the wind. There were well defined facets under a wind and heat formed crust from the recent high pressure period. Slide is up to almost two feet deep in a few areas. We continued up the ridge to the point where a steep ascent is required to gain Wilson Peak. That whole ridge line remained in place, without sliding when the sheltered went. 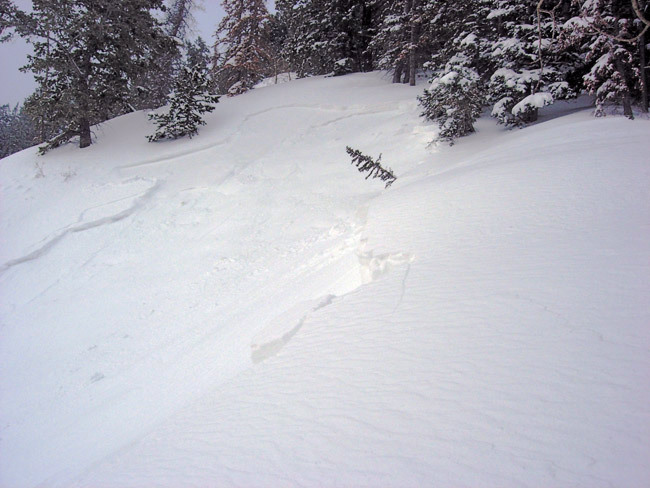 We decided the best option was a traverse from the ridge over onto the bed surface of the avalanche, skiing down off the bed surface, only after the angle lessoned. Just too much hang fire. At the bottom, the group split with one and his dog descending Alexander. We traversed over to the steep little bowl east of Wilson Glade. 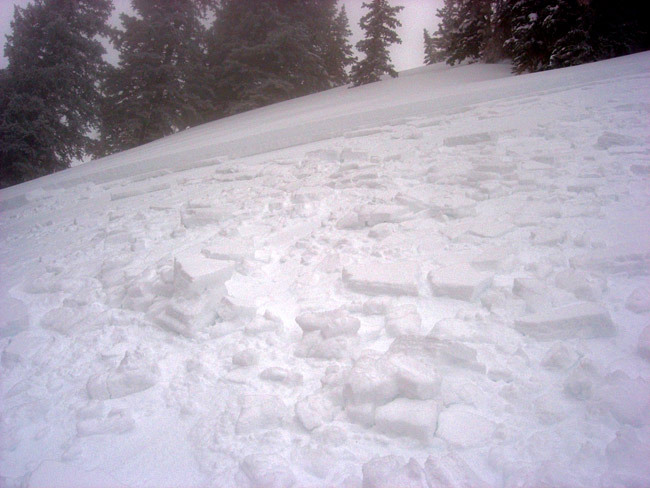 It was too steep to ski based on previous observations, but a ski cut was planed to check stability. This slide pulled out on the approach, before a cut was attempted. Once again, the culprit was faceted snow under a crust, with this crust only eggshell thick. Followed the bed surface down and out to escape. My partner broke her ski in half on the bed surface, resulting in a long slog out, but she made it. This is the only picture I got of her, turning at the base of Toots to Boot. Flat light and snowfall, heavy at times prevents photography. That right ski looks to be flexing a little more than the other one. It's the ski that broke. 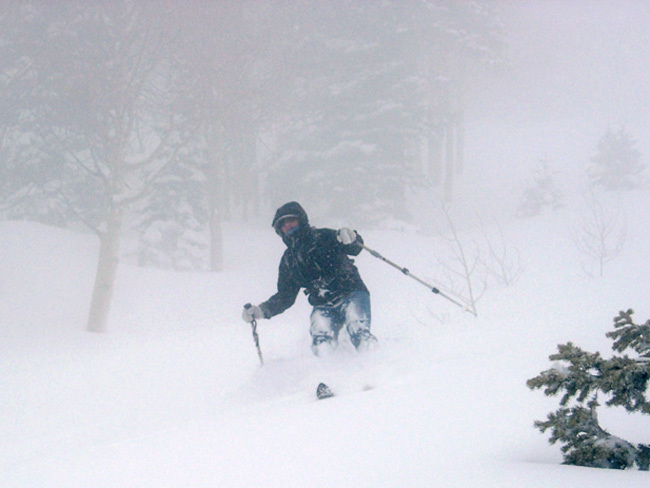 Interesting day with some good and some not so good powder skiing at the beginning of the first real storm in almost a month.